I have just been reading a short article about ‘play streets’ which appeared the Guardian recently. The article starts by noting that “in 1860, a 12-year-old Colchester boy was imprisoned for playing rounders in the road“. 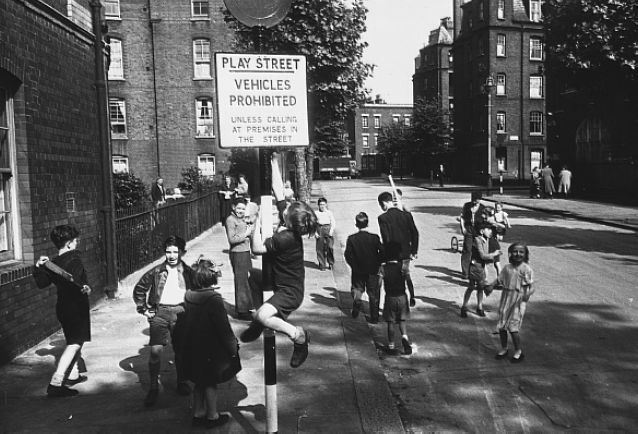 Playing in streets had actually been banned for over thirty years, nationally by the ‘Highways Act 1835’ (section 72) and in London by the Metropolitan Police Act 1839 (section 54). Both of these pieces of legisation allowed for a fine of up to 40 shillings for playing “football or any other game” in the street and it was apparently the failure to pay the fine which led to imprisonment of the boy. Indeed, according to a report in Hansard a total of 44 children had been imprisoned in 1859 year in London and Middlesex for playing in the streets! Incidentally, this legislation still in force as the Highways Act 1980 (section 161) which reads “if a person plays at football or any other game on a highway to the annoyance of a user of the highway he is guilty of an offence and liable to a fine not exceeding level 1 on the standard scale“. The Guardian article then went on the talk about how Play Streets were introduced to the UK from the 1930s with the ‘Street Playgrounds Act, 1938’, a piece of legislation that I hadn’t even heard of before which allowed streets to be designated for children to play in with use of vehicles restricted to residents and their visitors. These grew in popularity and by 1963 there were 750 streets around the country. The utility of these play streets unfortunately diminished over the following decades. The Guardian blamed Thatcher for the decline, however I can’t find any evidence for that; powers to create play streets are currently provided by the Road Traffic Regulation Act 1984 (sections 29-31) as amended by the New Roads and Street Works Act 1991 (schedule 8). I do however note that various other sources have suggested that the decline was due to streets becoming increasingly dominated by parked cars. By the 1980s Play Streets were evidently all but forgotten. I am pleased therefore to finally see all the renewed interest in play streets. Do check out Playing Out and the resources published by London Play. It is also encouraging that the ideas are getting cabinet level support in the person the Anne Milton, the Health Minister. There is one huge problem of course… where are all the parked cars going to go? I say that because Play Streets not only require restrictions on vehicle movements, they also require the removal of the many many parked vehicles that now litter our residential streets in order to both recover sufficient play space and to stop vehicle owners fussing their property being damaged as a result. After all, we find it hard enough to walk along the pavements of many streets due to parked cars, let alone having enough space for kids to run around and kick balls. Interestingly however, Rother Council note that the 1980 legislation should only be used where the playing of games in the streets is creating problems for other road users and not where the only issues relate to nearby properties. As such it would appear that the Act should not have been cited in many of the above cases. To be clear there appears to be no actual ban on playing games in the street, only a ban on causing ‘annoyance to other road users’ by playing games on the street. A particular treat for me when researching this post however, was to discover that the MP who had originally raised the issue in parliament back in 1860 was a certain T.J.Miller…. who happens to also be my great-great grandfather! One small correction for The Guardian. I believe that the boy was arrested for playing rounders in London, not in Colchester as reported. TJ Miller was indeed MP for Colchester, but he appears to have been discussing a London/Middlesex issue, not a local one. ← RAC Foundation – failing to see the obvious? In this day and age I think it’s ludicrous to allow children the right to obstruct traffic, irrespective of where they reside. Do these ministers live amongst our tiny, crowded streets? There simply isn’t enough room. Then there is the noise and anti-social behaviour issues that blight many a community. Before anyone asks, no, I am not anti-child. All children get into trouble one way or another, it’s part of growing up. I’m not against kids per se, I’m against bad parents bringing up bad children, who see ball games as an opportunity to try and terrorise the community in which they live and without fear of reprimand. I also try seek ways to find alternatives, like protecting the last remaining areas of open land, but even then, countless children and young adults all congregating in one space can be and is a huge problem. Some of these ministers should walk around my neighbourhood – I doubt theirs is the same. Street upon street, the incessant sound of a ball being banged hard against the floor can be heard, along with the screams and the abuse towards pedestrians, cyclists and car drivers all of whom are simply trying to get from point A to point B (the nerve). No, it is no longer acceptable to fill streets with screaming children running amuck. It is simply unsustainable. We do not have the space. It encourages bad behaviour. It creates hazards and yet, at the end of the day, if a child is injured WHO gets the blame? It’s the cyclists.. the driver.. basically anyone who objects. I implore these ministers to spend one single day in my neighbourhood and see if their view does not change- let THEM be made to feel like prisoners in their own homes, surrounded by almost constant nuisance. When I was a child we were taken to a field by an adult, and if an adult complained in a street? We generally respected their wishes. Not so these days. I don’t know where you live or what you are having to put up with, however… here is a version of your comment which I have adapted to fit more with my own experience. “In this day and age I think it’s ludicrous to allow private motorists the right to obstruct local communities, irrespective of where they reside. Do these ministers live amongst our tiny, crowded streets? There simply isn’t enough room. Then there is the noise and anti-social behaviour issues that blight many a community. “Before anyone asks, no, I am not anti-car. All motorists get into trouble one way or another, it’s part of being an adult. I’m not against motorists per se, I’m against bad motorists bringing up bad motorists, who see cars as an opportunity to try and terrorise the community in which they live and without fear of reprimand. I also try seek ways to find alternatives, like protecting the last remaining areas of open land, but even then, countless motorists and motorcyclist all congregating in one space can be and is a huge problem. “Some of these ministers should walk around my neighbourhood – I doubt theirs is the same. Street upon street, the incessant sound of a vehicles passing can be heard, along with a risks of death towards pedestrians, cyclists and children all of whom are simply trying to get from point A to point B (the nerve) or just hanging-out with friends. “No, it is no longer acceptable to fill streets with noisy and dangerous private vehicles. It is simply unsustainable. We do not have the space. It encourages bad behaviour. It creates hazards and yet, at the end of the day, if a child is injured WHO gets the blame? It’s the child. I implore these ministers to spend one single day in my neighbourhood and see if their view does not change- let THEM be made to feel like prisoners in their own homes, surrounded by almost constant nuisance. When I was a child there were far fewer cars. Children were free to go and see friends and go to the park unsupervised. Motorists were more careful and respected the needs for children? Have only just come across your site – a great resource, thank you! Just to clarify about the issue of parked cars on play streets, the ‘Playing Out’ (Bristol) model doesn’t actually require people to move their cars off the street – it just diverts through-traffic for a couple of hours at a time, up to once a week. It actually works fine having parked cars on the street and residents driving in and out at walking pace and helps everyone to get used to the idea of sharing the space. It isn’t meant as the long-term solution as I believe residential streets are public spaces where children should be able to play out safely every day, but more as an awareness-raising exercise and stop-gap until this becomes possible through a general change in culture.